A CALL FOR FLAME VOLUNTEERS! You get to spend time with others who love languages. You get to work with like-minded people who really appreciate your being there. FACT: FLAME runs on volunteer work, and without volunteers, FLAME would cease to exist. We need YOU! Take a look at the list of committees and please consider joining us and being an active part of FLAME! For more information about any committee and/or to sign on, contact the committee chair or FLAME President. For their names and addresses, click HERE! Certification: Convened when there are issues that need to be addressed regarding certification. Conference: Organizes the spring conference in Portland. Meetings are held once a month for about two hours. Members attend to specific responsibilities, including pre-conference, presenters, exhibitors, conference site, and program layout and printing. FLES-Middle School: Organizes the annual fall FLES-Middle School Network Conference in the fall and a FLES session at the FLAME conference in March. Current members are Judith McKernan, Charles Hicks, Marie James and Sylvie Charron. K-16/ Professional Development: Studies teacher professional development needs to facilitate and improve student learning throughout the K-16 years. 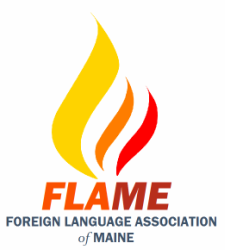 Provides a liaison between the FLAME Advisory Board and The Roundtable on Second Language Learning in Maine, sponsored by the University of Maine and Colby, Bates and Bowdoin Colleges. Newsletter: Publishes the Flame Newsletter and the Flame Resource Directory. Meets as needed; much of the work can be done through the mail or E-mail. Members write, type, proofread, and prepare mailings. Public Advocacy and Government Relations: Raises the general public’s awareness of the value of second language competence and promotes acceptance of the study of a second language as an integral part of every child’s education. Members contribute their thoughts and ideas on how to make second languages visible and do outreach in the public and private sectors. Professional Development: Improves professional development opportunities in Maine and informs modern and classical language teachers of the opportunities that exist. Meetings are two to three times a year. Members gather information about what is needed by modern and classical language teachers throughout the state. Public Relations: Gathers and shares information about press contacts, how to gain attention in the media. Possibilities include the creation of a PR hotline and a clipping file on languages in the news. Student Activities: Provides enrichment activities for foreign language students in Maine. A juried exhibit of student work is held in conjunction with the annual spring conference. More will be offered as the interests of committee members dictate. Summer Institute: Plans and hosts the week-long FLAME Summer Institute. Members reserve a site, find speakers, plan the daily activities, and prepare mailings. Web Site: Contributes to designing and updating the site. Assist current Webmaster with a view toward becoming that person’s knowledgeable replacement. To ensure continuity and competence, the position of Webmaster needs to be a fairly long commitment. Interested in knowing more about how these committees work? Click HERE for job descriptions. For a volunteer form, click HERE (coming soon).